The LCD display message will appear on the Canon ImageClass MF4100’s screen as an indicator to the user that the toner must be changed or redistributed. The TONER GUAGE button can also be pressed periodically to check if the unit’s toner cartridge is getting low. Either way, users should remove the cartridge using the following procedure, but instead of installing a new cartridge, first try shaking the cartridge around in various rocking motions, being careful not to spill toner, and then reinstall the old cartridge. Sometimes this process loosens up enough toner inside to extend the life of the cartridge. If it doesn’t it is time to switch to a new cartridge. To redistribute the toner inside of a cartridge, lift the scanning platform and then open the printer cover underneath it. If done correctly, the toner cartridge should be seen sitting in a trough underneath the cover. This cartridge is not locked in place and can simply be lifted out carefully and rocked back and forth, then placed back in its original position. When attempting to redistribute the toner inside a cartridge no longer becomes effective, a new cartridge must be installed. It is best to keep toner cartridges on hand as there is no guarantee that the redistribution process will be effective even on the first attempt. Open the scanning platform and printer cover to remove the old cartridge. It is best to recycle this cartridge and keep it separate from common waste. 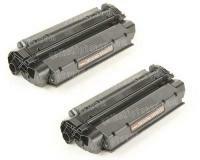 New cartridges should be rocked and shaken as old one’s are to distribute the toner inside them evenly. Hold a new toner cartridge by its handle with the arrow printed on it facing away from you/towards the printer. Pull out the seal from the SIDE of the cover and do so straight away from the cartridge, never at an angle. 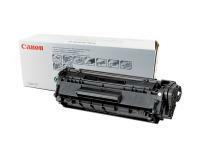 NOTE: Unlike other toner cartridge the DRUM PROTECTIVE SHUTTER SHOULD NOT BE OPENED by hand on cartridges for the Canon ImageClass MF4100. Doing this could damage the cartridge. Insert the new cartridge into position as far as it will go, giving it a press to make sure it is snugly in place. Close the printer cover and then the scanning platform and watch not to get your fingers caught while doing so. The key to transporting the Canon ImageClass MF4100 is to avoid VIBRATION DAMAGE. This can be done easily by removing the moving parts from the machine before transporting it. Carrying it across the office can be done without taking these precautions but the unit should not be moved by vehicle with parts installed. Turn OFF the main power switch and disconnect the power cord and all other cables from the back of the machine. Remove the toner cartridge by opening the scanning platform and printer cover. 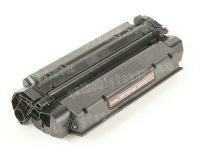 The toner cartridge MUST be stored without exposure to light or its life will be greatly shortened. Close the printer cover and scanning platform. Remove the dust cover from the feeding tray as well as ANY PAPER still inside the tray. The dust cover can be stored inside of the machine by fitting it in the small storage rails above the paper tray. Push the paper guide rail inwards and then close the feeding tray until it stays in position. Next, fold the paper stopper (small tab at end of tray extension) and push the tray into the machine. Be sure all covers are closed and hold and lift the machine by the handles on either side of it. Overview: The Canon Copier ImageClass MF4100 is a multi-function laser printer that is capable of printing, scanning and copying at a quite reasonable price range. Though lacking in another feature that other multi-function printers have, which is faxing function, the Canon Copier ImageClass MF4100 looks impressive with what it has, and delivers nicely, especially for small offices who do not really need a fax line or those who already have a solidly working fax machine. Pros: The Canon Copier ImageClass MF4100 features a minimal design, with a grey front panel and a white, solid finish on its body. Even its menu display panel is consistent with the machine's design, with a monochrome. single line menu. Its ergonomic design should also allow the MF4100 to fit in nicely in a small office, without much hassle since there are no awkward protrusions in the Canon Copier ImageClass MF4100. The Canon Copier ImageClass MF4100 offers respectable printing speed for a multi-function printer, clocking at a rate of 20 pages per minute, as there are few common and multi-function printers in the market today that can match the Canon Copier ImageClass MF4100's combination of speed and price. Another nice feature that even expensive multi-function printers do not have is the Canon Copier ImageClass MF4100s duplexing capabilities, a very important feature a lot of offices now look for in buying printers. The duplex feature can be set to operate automatically, saving time and effort, which is quite essential especially for busy workplaces. An added feature, the automatic double sided printing mode enables the Canon Copier ImageClass MF4100 to allow for 2 on 1 printing, quite helpful in printing out professional pamphlets and brochures for any office. The scanning function of the Canon Copier ImageClass MF4100 also speaks volumes for an inexpensive multi-function printer, with a color bit depth of 24-bit, capable of producing quality images and graphics. The scanning function also has a dust and scratch removal option, a very nice feature especially for documents or images that have some impurities. Copy function of the Canon Copier ImageClass MF4100 is also fast, with 20 copies produced per minute. Maximum resolution for the Canon Copier ImageClass MF4100 stands at 1200 x 600 dots per inch for copying, good enough to produce quality scans of images and graphics. Connectivity, particularly network connectivity is also included in the Canon Copier ImageClass MF4100, with its high speed USB interface coupled with an optional networking through an additional network device, like the AXID 1650. The Canon Copier ImageClass MF4100 comes in with a 250-sheet capacity for its document tray, while the sheet output tray has 100. the Canon Copier ImageClass MF4100 also has an additional multi-function slot for thicker media like envelopes or transparencies. Cons: Though considered a great value for a multi-function printer, the lack of a fax line in the Canon Copier ImageClass MF4100 is something that Canon might have considered before its release, with a number of multi-function printers having a fax capability. The scan function can also use improvements in its resolution, with only a maximum dots per inch of 600 x600. The Canon Copier ImageClass MF4100 also only includes a starter toner cartridge, and though replacements are quite inexpensive, a standard toner cartridge with a 2,500-page yield would have been a nice inclusion with the Canon Copier ImageClass MF4100 package.